You know the real estate drill: Location, location, location. Unfortunately, in some of the nation’s top locations, buyers feel priced out due to rising home prices…and rising down payments. Is it time to pack up and find a more affordable location? Maybe not. 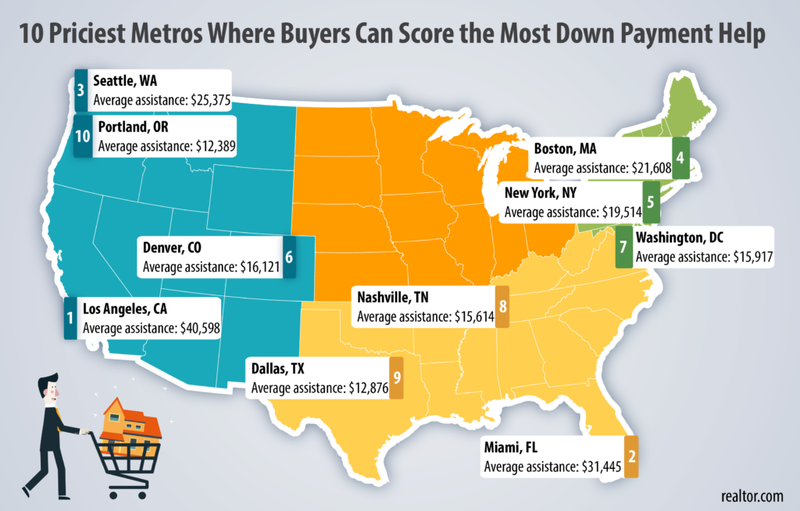 Down Payment Resource worked with Realtor.com to rank 10 pricey metro areas where you can get the most down payment help. Many buyers aren’t aware that there are grants, forgivable loans, deferred-interest loans, below-market first mortgages and even tax credits that can help you save a bundle on your down payment and closing costs. Fast forward your home search by taking a deeper look at 10 hot spots and the average amount of down payment help available. Interested in learning what programs are available in your market? Search by neighborhood, city or county using the Down Payment Resource program search. « Do You Know How Much Down Payment You Need?